This week, I conquered my first home renovation project, installing laminate flooring on a concrete slab floor in our finished basement. Thanks to Arrow Fastener for sponsoring this video, check out Arrow's full line of tools and fasteners. After cutting the short tongue off the first board and cutting the last board to length, I ripped the tongue off of all three of the boards from the first row. As you might notice, I actually got this backwards, ripping off the groove instead, and this caused a ton of frustration when trying to install those first few rows. 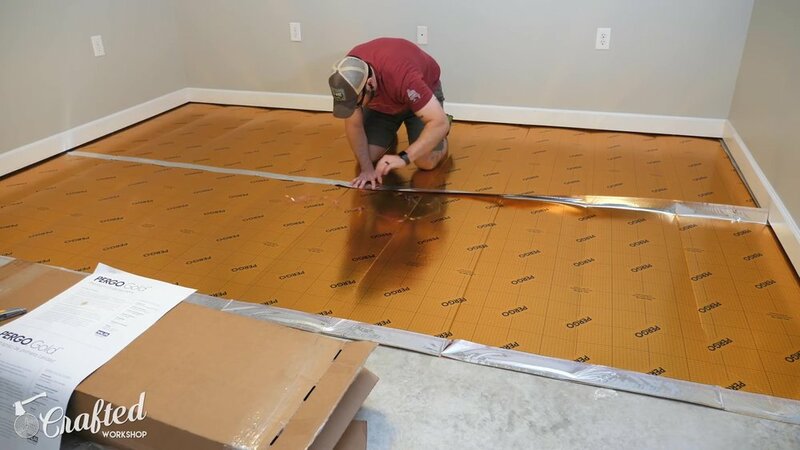 It’s technically possible to install this flooring with the groove facing the wall, but it’s a heck of a lot more difficult. Once I figured out my error, I started over with fresh boards and this made my life a lot easier. With my corrected boards, I could get to assembling the first two rows. To attach the boards, I first lifted the board, with the tongue facing the groove, until it was fully seated, and then I could push down to lock the boards in place. On the second board on the second row, I repeated the process, seating the tongue and groove on the long edge of the board, but I then needed to tap the board to seat the short edge. From there, I could just continue installing more flooring. While I’m installing, let’s talk about the sponsor of this week’s video, Arrow Fastener. Arrow makes a wide variety of fastening tools including staple guns, nailers, glue guns, riveters, and more. I used the Arrow PT18G brad nailer and Arrow brad nails to install all of the trim on this build, and I have a ton of projects featuring Arrow tools coming up, including some exclusive projects going up on the Arrow site, so stay tuned. If you'd like to learn more about Arrow and their full line of fastening tools and fasteners, check out the link in the video description below. I just kept installing flooring until I got to my next obstacle, a transition.